Publié dans: Africa Defense Journal. Due to an assignment overseas this blog will be closed for a few weeks. I apologise for the inconvenience. En raison d’une mission a l’etranger ce blog sera ferme pour quelques semaines. Je m’excuse de cet inconvenient. A handful of U.S. Marines taught more than 220 Liberian soldiers non-lethal weapons skills February 17-March 18, 2012. The three Marines built on an ongoing State Department-sponsored mission aimed at rebuilding Liberia’s military called Operation Onward Liberty. They and around 16 Liberian instructors went over intermediate riot control and peacekeeping techniques meant to restore control without causing fatalities. Special Purpose Marine Air Ground Task Force 12, the Marines’ unit, is charged with sending small security and logistics cooperation teams into Africa to partner with local militaries facing regional terror threats or instability. Liberia was one of a half dozen countries the task force visited over the course of their six month deployment in support of U.S. Marine Forces Africa. « You’re going to use lethal force in combat, but you’re not going to use lethal force in a riot, » explained Gunnery Sergeant Robert Navarro, team non-commissioned officer in charge, adding that deadly measures can sometimes lead to more chaos instead of restoring order. Sergeant Mark Benz, who earlier taught SPMAGTF-12 Marines nonlethal weapons techniques, had to mold his curriculum to fit the Liberian soldiers’ work schedules and available training materials, but said he was none the less impressed by his students’ enthusiasm. The team’s hard work paid off at the end of the training evolution when their students put on a large-scale demonstration of their new skills for Burundi’s defense minister. The team conducted the second of a three phase nonlethal weapons training program with the Liberians, said Navarro, building on Onward Liberty’s progress. Future training teams will move into the third and final phase of the training. A major focus of the mission was making sure the small group of Liberian instructors the Marines worked with could continue training their own men after the Marines left, he added. South Sudan’s army spokesman has said Sudan has attacked a disputed oil-producing border region with warplanes and artillery. Philip Aguer said Tuesday’s clashes erupted when troops from Sudan entered the Heglig region which they held for sometime before they were driven out. He said two brigades from the Sudanese army accompanied by « mujahedeen and other militias » took part in the attack. Al-Sawarmi Khalid Saad, Sudan’s armed forces spokesman, could not immediately be reached for comment on his mobile phone. South Sudan, which seceded in July, has been locked in a bitter dispute with Khartoum over oil payments and other issues, and clashes in the ill-defined border region last month raised concerns they might escalate into full-blown war. President Yoweri Museveni has said the success registered by the Uganda People’s Defence Forces (UPDF) contingent that is serving in Somalia is due to Uganda’s ideology, discipline, training and political solidarity. President Museveni, who is also the Commander-in-Chief of the Armed Forces, was yesterday passing out soldiers who had concluded a seven month peace support operations course at Singo Training Centre in Nakaseke district. The soldiers are due to leave for peacekeeping duties in Somalia. Museveni observed that the officers who are serving with the African Mission to Somalia (AMISOM) have recorded tremendous success due « to our ideology of Pan-Africanism ». He said Somalia is part of the African continent, adding that when Ugandans were fighting the dictatorship in their country, they got support from Tanzania and Mozambique. « It is on this note that we could not ignore our brothers, the Somalis, » the President said. Museveni said the UPDF troops were sent to Somalia under the policy that Africa is one and that we are all Africans. He added that the NRM Government rejects traits of sectarianism based on tribe or religion. Museveni told the participants that during the liberation struggle, operational etiquette never tolerated members of the force who spoilt the dignity of women, never condoned killings or used bad language. He reminded the soldiers that the UPDF contingent in AMISOM has had good training and maintained combat readiness. The President, therefore, advised the soldiers to be systematic and fully alert in their operations, taking particular care of their own lives, especially in the event of encountering suicide bombers. He commended the political solidarity in Africa that is geared towards addressing the Somalia issue. Museveni also lauded the international support extended to AMISOM by the US, Great Britain and other countries signified by their provision oflogistics. He urged the soldiers to be vigilant and desist from engaging in extra-marital affairs while in Somalia. The President commended the UPDF leadership for their role in training the soldiers. Kenya-Somalia: Major-General Karanja becomes AMISOM’s second in command. Kenya’s Maj. Gen. S. N. Karanja has been appointed deputy commander of the African Union (Amisom) peacekeepers in Somalia. The appointment is, however, subject to approval by AU Commission on Thursday, official said. Maj Gen Karanja’s appointment was contained in a statement from Kenya’s Presidential Service (PPS) sent to media houses Tuesday. The statement said that the appointment was made by President Mwai Kibaki following recommendations of the Defence Council. Several other changes were also made in the different departments of the Kenyan Armed Forces. Several officers were promoted, redeployed and others retired. Ugandan Major General Fred Mugisha is the Amisom commander. South African Defence Minister Lindiwe Sisulu has confirmed that the country will increase its naval budget. Answering a question from Engineering News Online at a press conference at the 2012 Indian Ocean Naval Symposium (IONS) in Cape Town on Wednesday, Sisulu stated that the amount would be announced in her department’s budget. SADC heads of State adopted the SADC Maritime Security Strategy in Angola on August 9, 2011. This comes against the backdrop of growing SADC concern about piracy and other forms of maritime crime and insecurity. In her keynote address opening the conference, Sisulu pointed out that African countries were « particularly reliant on the sea and thereby vulnerable ». She highlighted that, in 2006, the global total of people taken hostage at sea was 186, but that in 2010 the figure for the Indian Ocean alone was 1 016. She affirmed that the SADC was expecting increased pirate operations off its east coast. During the 12 months from March 2011 to the end of February 2012, there were 57 pirate attacks in Tanzanian territorial waters, reported Sisulu, citing her Tanzanian counterpart. This was « an unprecedented number, but one that is indicative of the relocation of piracy to the SADC ocean ». Sisulu appealed to the IONS delegates, who come from 86 countries (both Indian Ocean rim States and observer nations) to advise the South African government on the issue. 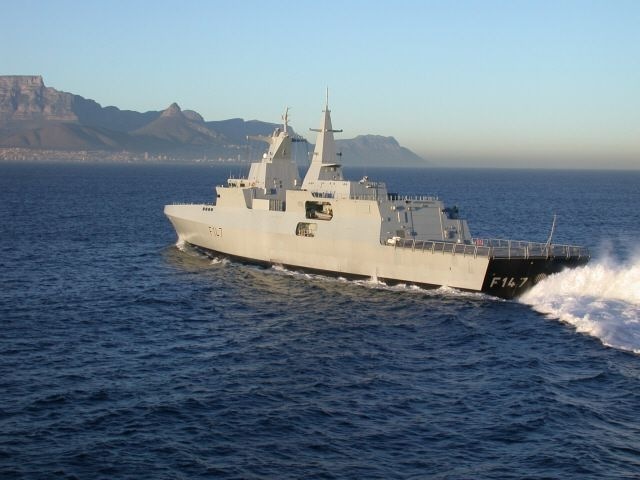 South Africa now has a trilateral agreement with Mozambique and Tanzania, which allows the South African Navy (SAN) to undertake operations in their waters. « This agreement allows us to conduct all activities aimed at strengthening SADC on the east coast, » explained SAN Chief Vice-Admiral Johannes Mudimu to the press conference. He gave the assurance that the anti-piracy operation, codenamed Copper, (and which involves the South African Air Force, Special Forces and South African Military Health Services as well as the SAN) is continuing uninterruptedly. « Currently, in the Mozambique Channel, the SAS Drakensberg is taking over from the SAS Isandlwana, » he revealed. Although the SAS Drakensberg is primarily a tanker – it is officially designated a combat support ship by the SAN – Mudimu gave the assurance it would be effective in fulfilling the mission. All four of the SAN’s frigates have now done anti-piracy patrols in the northern Mozambique Channel. « We’re trying to involve as many assets as possible, » said Mudimu. Nigeria’s army chief told his soldiers they needed to be in « war mood » to fight the Islamist sect of Boko Haram, suggesting that peace talks with a sect that has killed hundreds of people this year were not on the government’s agenda. Nigeria’s attempts at mediated dialogue with the group have repeatedly failed. The latest talks broke off last month after details of negotiations were leaked to the media. In Boko Haram’s home town of Maiduguri in the remote northeast, five sect members and one policeman were killed on Wednesday in an attack on a police station, authorities said. « It is high time for you and your men to be in war mood to be able to deal with the current challenges, » Azubuike Ihejirika, Chief of Army Staff, told soldiers at an army workshop in the northern city of Kaduna. He said more resources would be given to the army to help it combat what he described as terrorism. He expected the army to have « a better deal within this budget year », which would mean « a lot more equipment being put back into service ». On Easter Sunday, a car bomb near a church in Kaduna killed at least 36 people and another large undetonated bomb was found in Kano, Nigeria’s second largest city and scene of Boko Haram’s most deadly attack that killed over 180 people in January.